Photographs reveal the heart of the photographer. Tamayura is a 4 part OVA. This “first impression” review is based on the first two episodes. 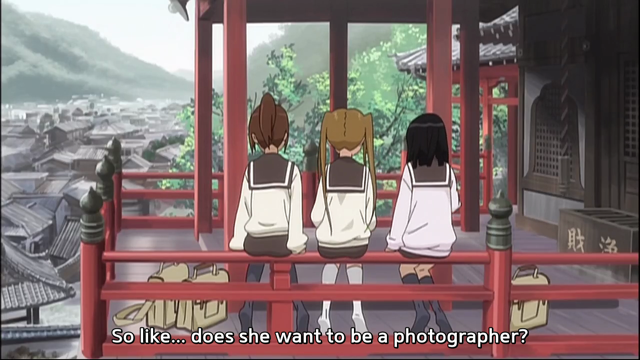 Tamayura is a slice-of-life show about a young photographer. The director, Junichi Sato, is deservedly famous as a master of the genre, because of his work on Aria. Unlike Aria‘s exotic setting, this show takes place in the real sea-side town of Takehara, near Hiroshima. Hashihime has an interesting article about a visit to the real location by the cast. The word tamayura means something like, “transients”, and is explained in the show to refer to spots of light that appear in photographs, also called, “light’s children”. 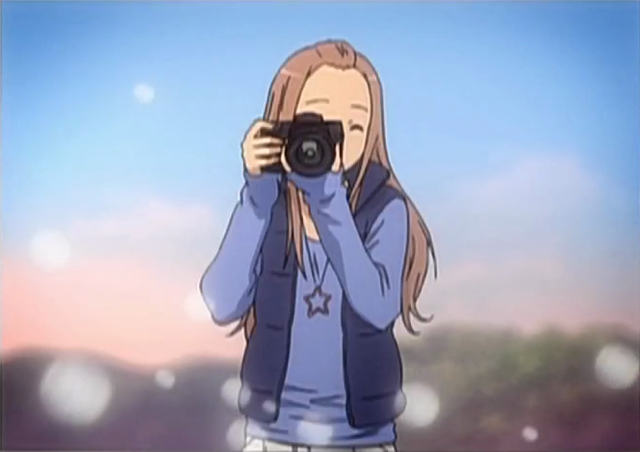 That gives you a pretty good sense of the show; an open-hearted girl wanders around a quaint, seaside community, making friends, and capturing transient moments with her camera. The OP is a cover of a song that was used in Kiki’s Delivery Service, sung here by the sublime Maaya Sakamoto. I don’t think it is particularly distinguishable from the original, but it captures the right energy for a show of this kind. True Slice-of-Life shows (the term has been devalued since Lucky Star) are about capturing the feel of a place and a moment. Often this involves very detailed observation. Instead of being driven by character or plot, these shows are allowed to drift a bit, or better, are given the time to explore and observe. As the saying goes, they “take the time to smell the roses”. Tamayura handles this in a couple of ways. First there is great detail in key objects with which the characters interact. 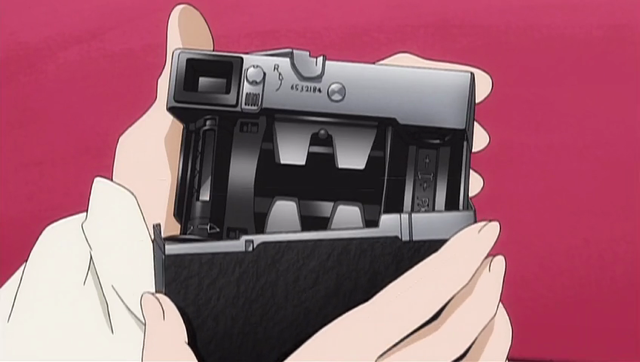 For example, we get to see the exact model of camera that Fu uses, and even see how it looks inside when she opens it up to load the film. 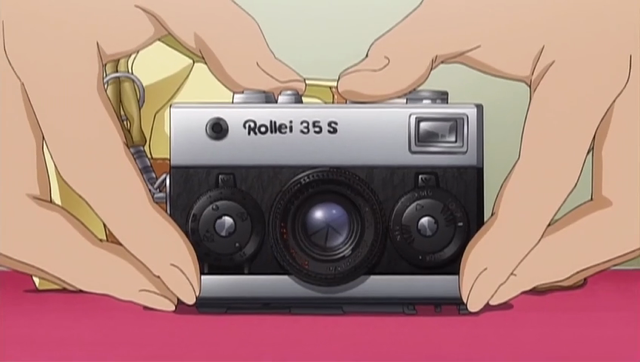 Fu's camera is a bit of an antique. Load the film in here. Another example is this delicious looking cake. 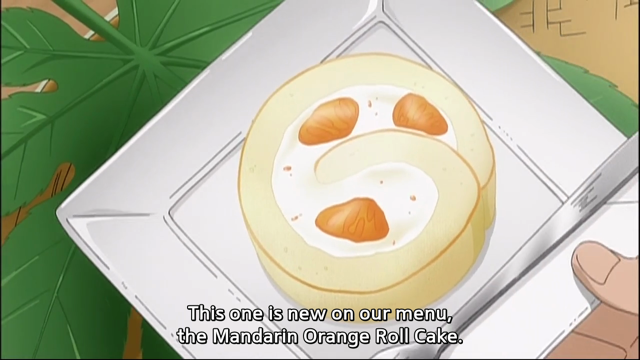 As they eat it (lucky bastards), they describe the way the orange flavor is picked up in the cream. As we follow the characters about town, we get to take in the sights, including Saihouji Temple, a Zen Buddhist Temple which dates (in its current form) back to 1602. Note the attention to architectural detail. This sort of show can confuse viewers who expect big developments, when the entire purpose of the show is really to enjoy a walkabout. In fact the plot for the first two episodes can be summed up as, Fu meets a couple of new friends and goes to a photography exhibit. Shihomi Riho, another photographer, surrounded by tamayura. Either you enjoy these Slice-of-Life shows or you don’t. If you didn’t enjoy watching Aria, or Yokohama Shopping Trip, you probably aren’t going to like Tamayura. If you enjoy these shows, which aspire to capture the heart of a place, give it a try, but don’t expect anything as rich as Aria, because four episodes is not enough to compete with the richness and complexity that three complete seasons can produce. I really love the OP sequence and, after a bit of research, saw that it was by the acoustic guitar group Depapepe, which has quite a few solid works through the years. They’re definitely worth checking out at any rate. Also, the lack of a soundtrack release for this anime leaves me in despair so I hope they rectify that since I really loved the calm piano stuff. Goes to show that no matter what Sato directs, he cares a lot about the music accentuating the scenes. Anyhow, as for the show itself, it’s solid. All of Sato’s works tend to have a soothing, healing quality to it and the characters come off as endearing, moreso than K-ON! I’m still trying to figure out what the subtle differences are between this and K-ON! 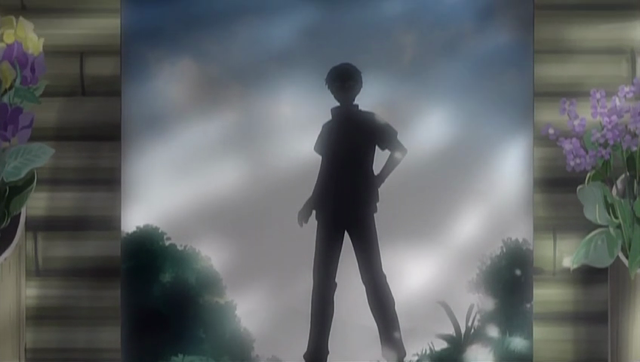 because this has captured my attention whereas K-ON! does not. “Relaxing” “Healing” I think you guys are on to something. With respect to K-ON, I lost interest in it quite quickly, so I’m not capable of judging. However, more generally, I think several of these shows have emphasized the characters themselves (thus: “cute girls doing cute things”), which misses the point that the characters are merely surrogates for the viewer, as they enjoy the rich experiences of everyday life. To bring it back to Aria, the point of the show isn’t so much to entertain us, as to convince us that eating a potato can be a rewarding experience.